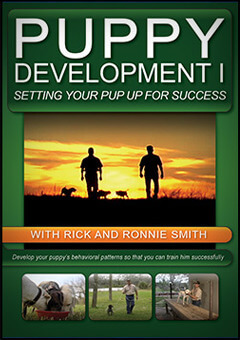 Puppy Development I reviews opportunities to gain your dog’s willing acceptance of restrictions which is necessary in training. This willing acceptance behavior is demonstrated in six sections: Crate conditioning, Care and Maintenance, Table Work, Puppy Drag Line, Stakeout Chain, and The Short Lead. Puppy Development II teaches you how to encourage your puppy’s inherent hunting instincts. It reviews four opportunities to build your dog’s enthusiasm for training and successfully introduces your dog to the Field, Birds, the Retrieve and the Gun. Both videos sold together.